During childhood, kids were told that heaven is where their guardian angels can be seen and where good people live. But it looks like a hidden spot tucked in Iloilo brought heaven to the earth. The place is known as Garinfarm Pilgrimage. Basically, it is a pilgrimage site and a resort inside a huge farm in Iloilo. The place caught the attention of tourists because of the highest point of the resort called journey to heaven. The spot requires a 480-step hike before witnessing the pure white sanctuary looking over a heavenly view. 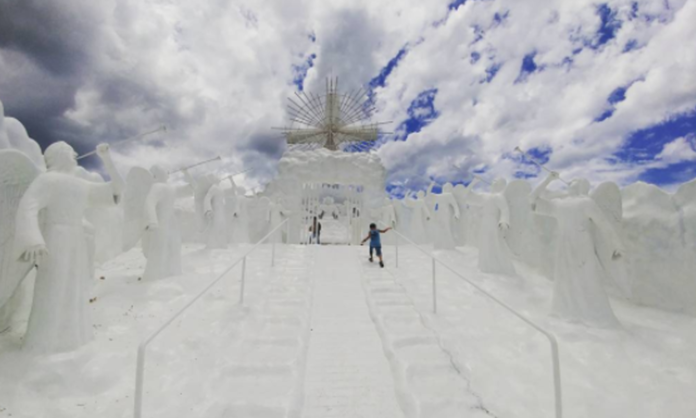 White-painted statues of angels with their trumpets awaits at the top, the whole place is hair-raising, giving travelers a taste of how majestic heaven could be. During sunset, the colors of the sky and clouds casts a beautiful gradient tint on the white background, cascading a beautiful play of colors. In addition to the said resort’s highlight, Garinfarm Pilgrimage’s amenities includes swimming pools, a lagoon for boating and zipline for a little bit of adrenaline-boosting activities.